Today is Harmony à la Carte’s first birthday and I can’t believe it’s been a year since I hit that post button for the first time. I had procrastinated starting a food blog for almost a year, but one day just dove head first into custom CSS code and this baby was born. Like many food bloggers, I started this partly as a creative outlet and partly to share my evolving dietary habits and everything I have learned in the process. I had been a health foodie for several years, but went on a 4 month honeymoon with macrobiotics in early 2013 which taught me so much about food, my body, my food choices, and myself. I learned to listen to my body, to treat it with kindness and give it what it needs and it responded well. While I haven’t been following macrobiotics strictly, I credit it for giving me a push in the right direction and for leading me to the development of this blog. I’ve become a healthier, happier and more creative cook as a result and I continue to grow and evolve in my food journey everyday. For those who’ve been reading along regularly, you know I’ve also embarked on an adventure recently and I’ve gone back to school to become a registered holistic nutritionist. It’s such a relief to have finally found my passion. Better late than never. Speaking of birthdays, yesterday, March 5, was actually my “legal” birthday. I say legal because I was actually born on January 17, in a small town in the Bekaa Valley in Lebanon. It was winter and times were tough and since they had a long way to travel through Mount Lebanon to the nearest city they didn’t get around to registering my birth until a month and a half later. I’m still not sure why it wasn’t back dated to my actual birth date, but so be it, I can be thankful because I have two birthdays and can celebrate twice a year. Who wouldn’t want that? 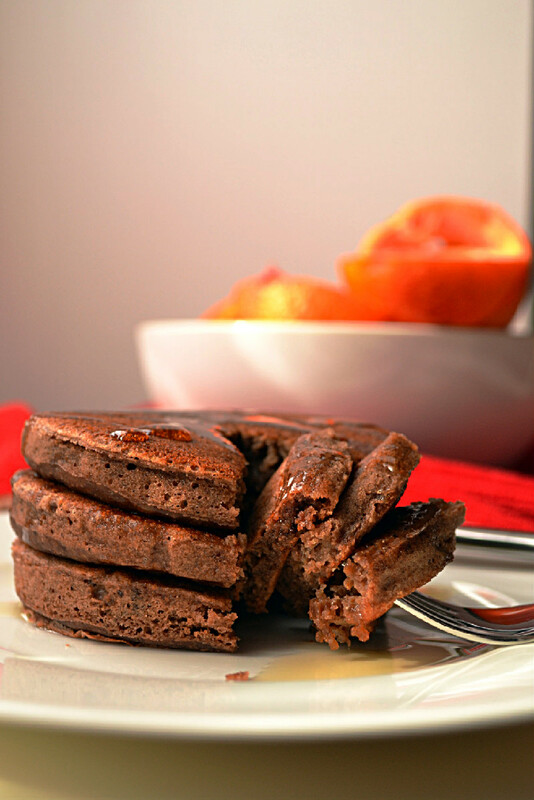 In the spirit of birthdays, blog anniversaries and the weekend, here’s a Blood Orange Cacao pancake recipe to help you celebrate. I’m not going to get into a long discussion on the nutritional value of this recipe, they are pancakes after all. However, I just want to point out that living a healthy plant based lifestyle doesn’t mean you can’t enjoy a decadent breakfast from time to time. For us, that time is the weekend. I usually make crepes, pancakes or a breakfasty baked good of some sort, on either Saturday or Sunday and very occasionally both. To keep things on the healthier side, I choose my ingredients carefully. 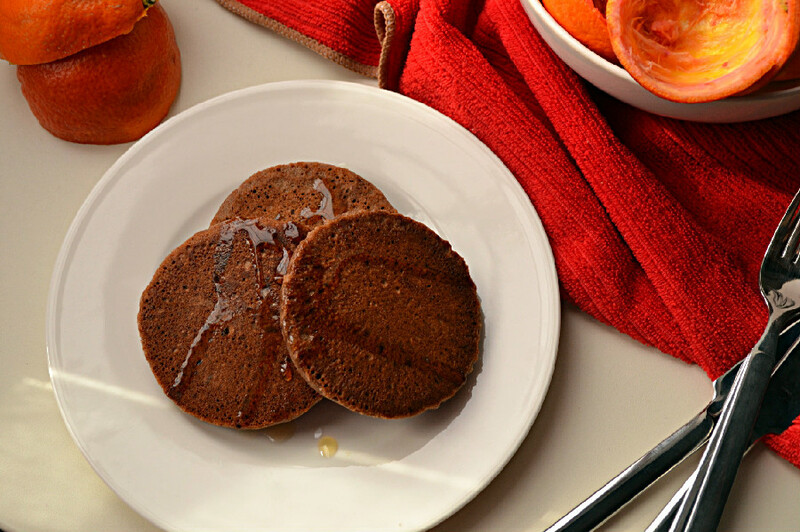 These pancakes are made with whole spelt flour which is higher in soluble fiber, vitamins and minerals compared to wheat flour. It’s also easier to digest and tastes slightly nuttier and sweeter and is more enjoyable overall, assuming you can tolerate gluten, as this whole grain is not gluten free. I also added pure raw cacao powder which is a great source of polyphenols (antioxidants), a natural endorphin and seratonin booster and the best way to have chocolate for breakfast. Citrus fruits are so welcome this time of year, adding a little brightness to a late winter day. 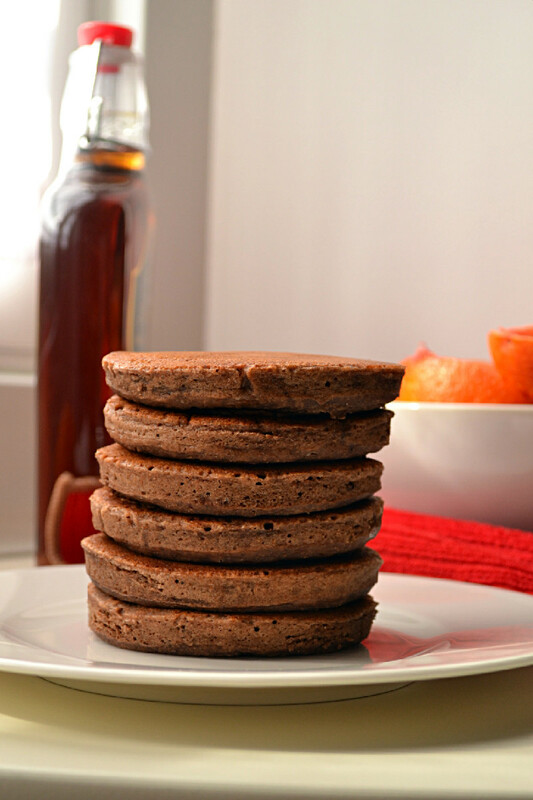 These Blood Orange Cacao pancakes are made with organic whole spelt flour and have an intense chocolate flavour with the tart sweetness of fresh squeezed blood orange juice. Perfect for a weekend breakfast or brunch. Preheat the oven to 100 C, and then reduce it to the lowest setting, just to keep it warm. Line a baking sheet or tray with parchment paper and put it in the oven, you’ll use it to keep the pancakes warm while you’re making them, so the first ones don’t get cold by the time the last one is ready. Sift the flour and other dry ingredients together into a large bowl, add milk and orange juice and stir to combine. Do not over mix the batter, a few lumps are ok. DO NOT ADD the apple cider vinegar yet. Now, add the apple cider vinegar to the pancake batter and stir to combine. The batter will expand at this point, which means you’re going to get nice and fluffy pancakes. It’s important to do this just before you start cooking the pancakes, and you’ll want to move as quickly as possible since the chemical reaction between the vinegar and baking soda/powder will weaken over time. Place about 1/4 cup of pancake into the center of the pan. I use a 3.5 inch cutter/shaper to get perfectly round pancakes, but this is totally optional. The result is 8 thick and fluffy pancakes. If you like your pancakes thinner, use less batter for each one and you’ll get about 10. Let the pancake cook until air bubbles start to form at the top, about 3 minutes. Be patient here, it’s important. The top of the pancake should be almost dry before you flip it. At this point, flop the pancake and continue to cook for an additional 2 minutes on the other side. Once the pancake is ready, Place it on the parchment lined try in the warm oven and proceed with the next pancake. Serve with pure Canadian Maple Syrup. Back when I posted my Life Changing Pancakes, everybody was asking how I got such perfect round pancakes and I told them, a cookie cutter! It really does make them perfect and fluffy. These look sooooo yummy! Love the chocolate!! I’ll take the whole stack ok?!! Ogm Brandi. I totally remember you posting those pancakes and thinking they looked perfect…it must have been in the back of my head when I decided to use the cutter/shaper. Come visit and I’ll make a stack just for you.